Provide comfort for the family of Carolyn Johnson with a meaningful gesture of sympathy. Carolyn Green Johnson, 92, widow of Wickliffe Wayne Johnson, passed away Monday, December 24th, 2018. 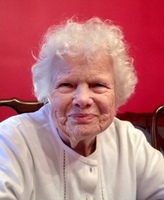 She was born December 23rd, 1926 in Madison, Indiana, daughter of the late Dewey Leonard and May Demaree (Tevis) Green. Carolyn was a devoted member of Faith Baptist Church, where she was a former member of the choir. Carolyn taught Kindergarten at First Christian Church and worked with the Sisters at Cardome in the Montessori classrooms, where she took over as Director when the Sisters left the Convent until she retired. She was a member of the Georgetown College Women’s Association, former member of the Georgetown Women’s Book Club and was an avid bridge player. Carolyn is survived by her daughter-in-law, Mary Jo (McKenna) Johnson; two granddaughters, Allison (Meg Coughlin) Johnson and Emily Johnson; two sisters, Lyland Green Gray and Dorothy Green Miller; one brother, James Michael Green; two sisters-in-law, Barbara Black Green and Jeanette Snidow Green. In addition to her husband, Carolyn was preceded in death by her son, Christopher Wayne Johnson; her daughter and son-in-law, Rebecca J. and W. Harvey Shrout; two granddaughters, Kristen Elizabeth Shrout and Lauren Rebecca Shrout; two sisters, Virginia Green Sainsbury and Mary Elizabeth Doyen; four brothers, Byron Matthew Green, John Frederick Green, Robert Louis Green and William Dewey Green. Visitation will be Friday, December 28th from 5 to 8pm at Johnson’s Funeral Home. Services will be held on Saturday at 11AM at Faith Baptist Church with Reverend Greg Earwood and Reverend Steve Hadden officiating. Burial will be at Georgetown Cemetery. Memorial contributions may be directed to the Johnson-Shrout Memorial Fund, in care of Georgetown College, 400 East College Street, Georgetown, Kentucky 40324 or to Faith Baptist Church, 116 Pocahontas Trail, Georgetown, Kentucky 40324. To plant a memorial tree in honor of Carolyn Johnson (Green), please visit our Heartfelt Sympathies Store. To Mrs. Johnson’s family, I was Becky’s sorority sister and roommate at Georgetown. Mr. and Mrs. Johnson were like my 2nd set of parents in college. I loved them both and Chris as well. I tried to keep in touch over the years. I will miss our telephone conversations. My condolences to her family. I am so sorry for the loss of your dear Mrs. Johnson. The God of heavens shares your loss (Ezekiel 18:32). He promises to return her to life again (Hosea 13:14). She will be young and in perfect health (Job 33:25). Jesus taught us to pray for that wonderful future at Matthew 6:9-10. Here is the link to the magazine about grieving that brought me much comfort, especially when I have recently loss several dearly loved ones in death: https://www.jw.org/finder?wtlocale=E&issue=2018-11&pub=g18&srcid=share. I hope it will help you as well. My heartfelt condolences to all of you. Philippians 4:6-7. Psalm 37:11, 29. Sending our love and prayers to all. Love, Kristine, Kathleen, Michael, Patrick, Julie, Jane, Meg, Peter and their families. 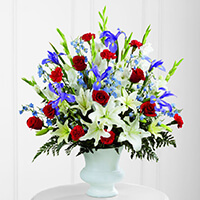 The McKenna siblings purchased the The FTD Cherished Farewell Arrangement for the family of Carolyn Johnson.